Trigger finger, or Stenosing Tenosynovitis, is a common hand condition that causes a painful clicking or locking of a finger or the thumb. The causes involve pathological thickening of the flexor sheath, the annular pulley system, and/or changes within the flexor tendons. Sometimes these thickenings can be felt as a palpable nodule, and often prevent the tendon from gliding inside the tendon sheath. 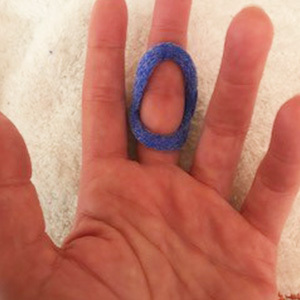 Patients often complain initially of asymptomatic clicking of the finger which may then progress to painful triggering and locking. 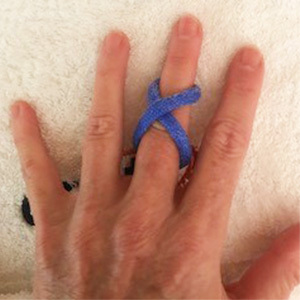 Triggering most commonly occurs at the A1 pulley whereas the triggering symptoms occur at the proximal interphalangeal joint (PIPJ). Either the flexor digitorum superficialis (FDS), flexor digitorum profundus (FDP), or both flexor tendons might be involved. 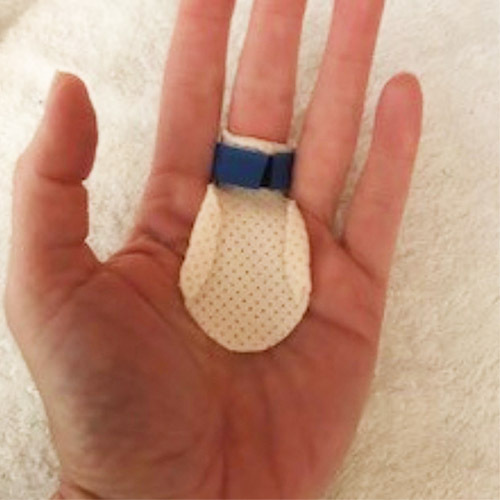 Conservative management of trigger finger typically involves wearing an orthosis to limit motion, but there is no consensus on the best orthotic design and/or the most effective wearing schedule. 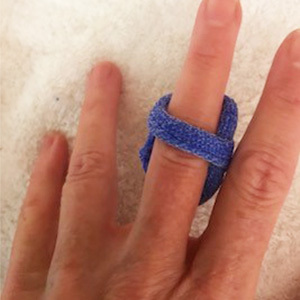 The researchers from Singapore randomized 35 patients with trigger finger (Green’s classification grade of 2 and 3) into two groups: one group received a proximal interphalangeal joint blocking orthosis (commercially available Oval -8 orthosis) and the other group received a metacarpal-phalangeal joint blocking orthosis (custom made ring orthosis over proximal phalanx described by Lindner-Tons and Ingell). The patients were instructed to wear the orthoses during all of their daily activities and to also keep track of the hours of use. Some were also advised to wear the orthoses during the night if needed. 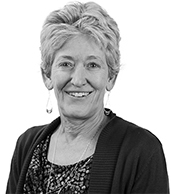 The researchers collected outcome measures including pain numerical rating scale, Green’s classification grading, and Quick Disability of the Arm, Shoulder and Hand and duration of orthotic wear. Green’s classification system is used to rate the severity of the triggering. The patients were followed up for 2 months, and changes between the initial and the final assessment scores within each group and between both groups were analysed. 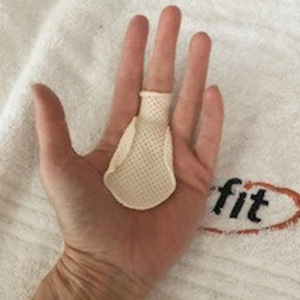 Results of this study indicate that both orthoses helped patients with a reduction of pain, but the group wearing the PIP joint orthosis had better pain relief. Both groups improved on the Green’s classification scale by at least one grade. The PIP joint orthosis group demonstrated significant improvement in the Quick DASH scores and wore the orthosis for significantly more time than the other group. 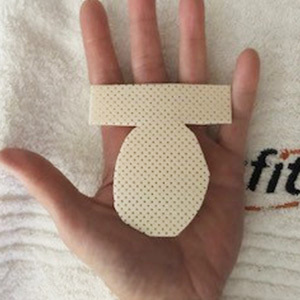 The study’s findings indicate that while both orthoses are helpful at pain reduction, the PIP joint orthosis allows better functional performance, is less restrictive and more cosmetically appealing than the custom-made MCP joint orthosis. The research also suggests wearing the orthosis for 24 hours per day for more than 8 weeks to get the best outcome. 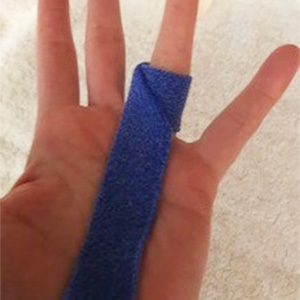 For making custom orthoses for the conservative management of trigger finger, for either of the above-mentioned designs or for your favourite design. Use our lightweight (1/12” – 2,5 mm or 1/16” – 1,6 mm) Orfilight in beige, Atomic Blue or Black to create highly conforming ring orthoses for the MCP joint design, or try Orficast in blue or black for a quick and easy fabrication process. Using Orfilight Beige, Atomic Blue NS or Black NS in 1/12” – 2,5 mm or 1/16” – 1,6 mm, cut out a T–shaped piece as above. Activate the material and wrap the wings around the proximal phalanx. 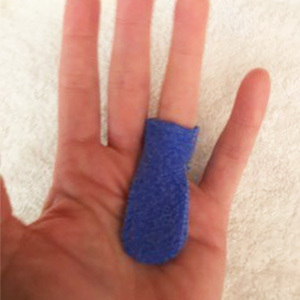 Pinch on the dorsal side and cut while warm to create a seam to allow the orthosis to easily slide on and off. Or open this seam when the material has cooled and apply a Velcro strap to hold it in place. 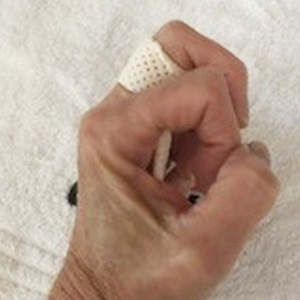 The material in the volar palm should block full MCP joint flexion of the involved digit. 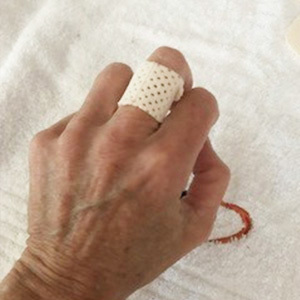 With one end, wrap around the proximal phalanx and seal. Folding on an angle as shown. 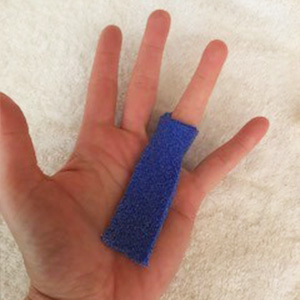 Stretch the material into the palm. Then fold on itself back up to the level of the volar PIP joint. Fold once more, stretching the end back into the palm. This creates a volar piece of three layers, while the ring around the proximal phalanx consists of one layer. Ensure that all thickness and seams are bonded together well. Trim the corners and allow for full PIP flexion, while preventing full MCP joint flexion. Using Orficast 1” – 3 cm width, cut a piece about 6”- 18 cm long. Activate and roll together tightly lengthwise, creating a narrow strip of material. 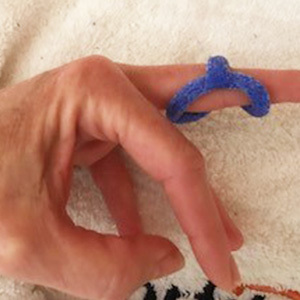 Form an oval shape over the volar finger, including the proximal and middle phalanges. Overlap the material on one side of the PIP joint. Continue placing the strip across the dorsal PIP joint and bond at the opposite side of the PIP joint. This orthosis can be slid off and on. 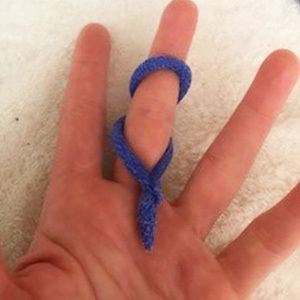 Create a Figure of 8 wrap around the involved digit, forming a Criss-Cross or “X” pattern over the dorsal PIP joint. Bond the edges together on the volar surface and trim the excess. Read our blog on the MCP Joint Blocking orthosis design. This video shows how to create a PIP blocking joint orthosis. 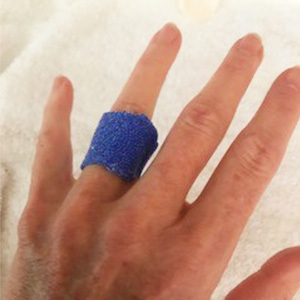 Simply turn the orthosis around on the finger to block PIP flexion. 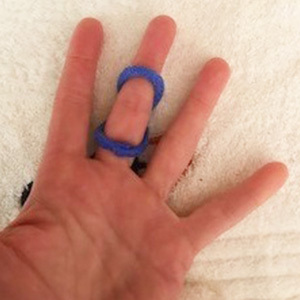 This video features a ring design orthosis for treatment of trigger finger. Teo, S. H., Ng, D. C. L., & Wong, Y. K. Y. (2018). The effectiveness of proximal interphalangeal joint–blocking orthosis vs metacarpophalangeal joint–blocking orthosis in trigger digit management: A randomized clinical trial. Journal of Hand Therapy.